Dome Lids | Detroit Forming, Inc.
DFI possess one of the largest number of dome lid tool inventories in the industry. If it is made from foil, plastic or paper, shaped round, square or oval, DFI probably has a dome lid to fit on top of it. 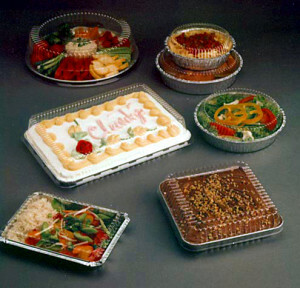 Whether you are packaging deli trays at a supermarket, applying dome lids to meals in a hospital or applying lids on a food processing production line, DFI will likely be able to meet your needs. Please allow DFI, and our experienced sales team, the opportunity to find the item that will meet your dome lid requirements. If DFI does not already have the item you seek, our experienced design staff can custom build the item you need. Either way, DFI clearly has you covered.